The Colon Cancer Coalition recently awarded CareFirst, formerly Southern Tier Hospice and Palliative Care, with a grant for $7,450 for its Palliative Care program. The funds were raised by Donna Marrone and Lori Spallone, event coordinators for the June 2012 Get Your Rear In Gear 5K run held in Horseheads, NY. CareFirst is the Southern Tier’s primary source for excellent care, support and knowledge that enable individuals to cope with serious illness. Early intervention is the key to increased quality of life for people living with serious illness. Through palliative care, patients and families are educated on navigating the many decisions and services that come with a serious illness such as colon cancer. 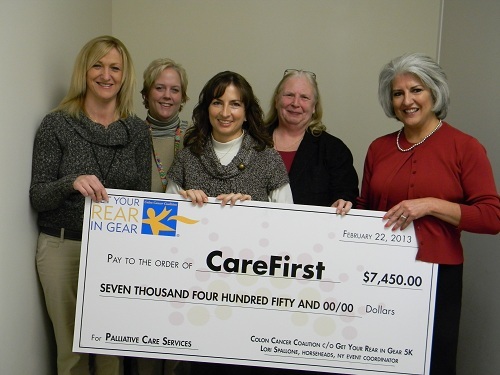 A check presentation was held on February 25, 2013 at the CareFirst satellite office in Elmira. Pictured from left, CareFirst social worker Stacey Jerzak, LMSW; CareFirst Palliative Care nurse Kate Hembrooke, RN; Get Your Rear In Gear event coordinator Donna Marrone; CareFirst CEO Mary Ann Starbuck; Colon Cancer Coalition champion Lori Spallone pose for a picture during the check presentation.